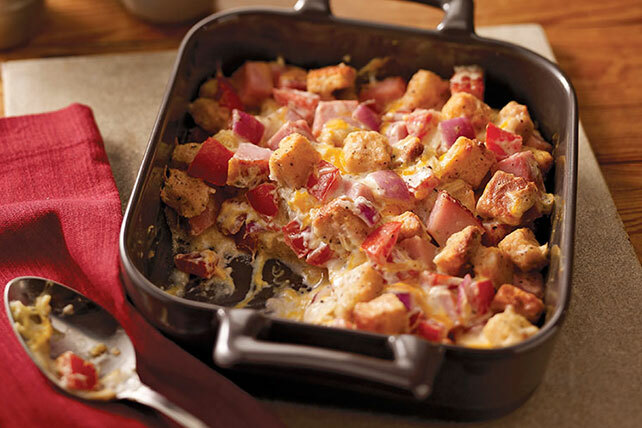 Cooked ham, crunchy croutons and a creamy, cheesy sauce make this casserole a weeknight winner—with a prep time of just 15 minutes. Spoon into 2-qt. casserole sprayed with cooking spray. Bake 35 min. or until heated through. Serve with a mixed green salad, and your favorite fruit for dessert. Sprinkle casserole with 1/4 cup chopped toasted PLANTERS Slivered Almonds or Walnuts before baking.